Aggie and Seminole captains pay honor to major General Harold C. Teubner, USAF (Ret.). During WWII, General Teubner flew one of the first B-29 units as a lead crew commander for the 444th Bombardment Group with missions covering the Dutch East Indies, Burma, Malaya, China, Formosa, Manchuria and Japan. After WWII, “Teub”, as his friends called him, took his BSME degree from Texas A&M, participated in the first nuclear weapons tests and was chief of Combat Crew Training with the Fifteenth Air Force (SAC). Teub attended MIT and obtained his Masters in Aeronautical Engineering in 1951. He then helped develop the curriculum and taught at the Air Force Institute of Technology graduate school, Wright Patterson AFB, until September 1953. His military decorations include the Distinguished Service Medal, Legion of Merit with oak leaf cluster, Distinguished Flying Cross with two oak leaf clusters, Air Medal with two oak leaf clusters, and Air Force Commendation Medal. 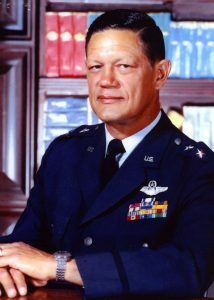 Teub retired from the Air Force in 1973.